President Trump didn't mention embattled Alabama GOP candidate for U.S. Senate Roy Moore for a long time into his "Make America Great Again" rally Friday, held just miles from Alabama in Pensacola, Florida. But when he did, it was a ringing endorsement. 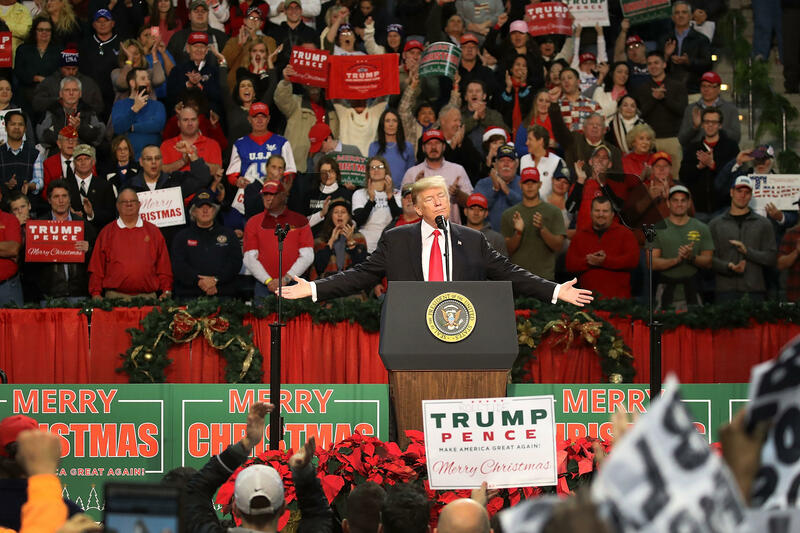 "Get out and vote for Roy Moore," the president told the energetic crowd, surrounded by "Merry Christmas" and "Trump Pence" signs. Ahead of Tuesday's election, Mr. Trump said the country "can't afford" to lose a Senate seat and have Democrat Doug Jones in the Senate. Moore, who won a primary against a Trump-backed Republican, Luther Strange, is accused of pursuing teenage girls when he was in his 30s. Mr. Trump questioned the yearbook presented by one of Moore's accusers, in which she says Moore signed his signature. The accuser, Beverly Young Nelson, later acknowledged she added the date to the yearbook by Moore's signature. Mr. Trump said there was a "little mistake made" and "she started writing things in the yearbook." "What are we going to do? Gloria Allred, anytime you see her, you know something's going wrong," Mr. Trump said, mentioning Young's attorney. Allred is also the attorney for Summer Zervos, a former contestant on Trump's former TV show "The Apprentice" who is suing Mr. Trump for defamation after he called her a liar for accusing him of sexual misconduct. "We cannot afford — this country, the future of this country cannot afford to lose a seat in the very, very close United States Senate — we can't afford it, folks," he added. "We can't afford to have a liberal Democrat who is completely controlled by Nancy Pelosi and Chuck Schumer, we can't do it," he said. Mr. Trump also called the political system "rigged" and said it was a "sick system from the inside." From the president's informal survey of the room, a number of people responded that they were visiting from Alabama. The president on Monday endorsed Moore for the first time since the allegations emerged last month. A recent CBS News poll places Moore at 49 percent, and Jones at 43 percent, with the majority of Republicans believing the accusations leveled against him are false. Mr. Trump spent some of his speech touting his electoral win, and acknowledging Florida's role in that victory, which now happened more than one year ago. Mr. Trump also brought up two media mishaps in the last week, at ABC and CNN. Last week, ABC's Brian Ross reported former national security adviser Michal Flynn was directed by candidate Donald Trump to make contact with Russians. Later, ABC clarified it meant candidate-elect Trump. Ross was suspended for one month. The incorrect detail prompted the stock market to temporarily plummet more than 300 points. "They shoulda fired him for what he wrote," Mr. Trump said. "He drove the stock market down 350 points in minutes, which by the way tells ya they really like me, right?" he added. Mr. Trump also brought up an incident earlier in the day at CNN, in which CNN reported an incorrect date related to WikiLeaks when anonymous sources attached the wrong date to the email. CNN eventually issued a correction. "And then CNN apologized just a little while ago," the president said. CNN is perhaps the president's favorite news outlet to criticize. "Oh thank you CNN, thank you so much," Mr. Trump said. "You should have been apologizing for the last two years." For additional coverage of the president's Pensacola rally, visit the live blog from earlier.